IVF has become so widespread now that there is a wide range of information available on the internet. If you are concerned about any step of the IVF procedure, your fertility clinic and your reproductive endocrinologist should obviously be your first point of call. But the internet can be a fine way of learning more about invitro fertilization and what to expect from the procedure. Unfortunately for some reason, the embryo transfer procedure does not receive as much coverage as other steps in the IVF process. Embryo transfer is a relatively simple procedure, compared to the other steps that precede it. But that doesn't mean there can be no side effects. Should you be concerned about abdominal pain and cramping after the embryo transfer? The embryo transfer procedure usually occurs on days three or five of your embryos' development. After the best embryos for transfer were pin pointed, either a single embryo or several embryos will be transferred into the uterus. They are inserted through a long, thin tube referred to as a catheter. It is a short procedure that usually requires no sedation or anesthesia, and is not painful but can be a bit unpleasant. Some women do experience mild pain or cramping after the procedure. While this can be an absolutely normal part of the procedure, that does not mean you should not inform your fertility clinic about your symptoms. 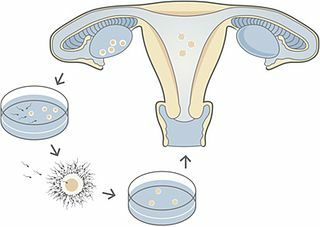 It is possible for the embryos to leave the uterus again through the cervix, and occasionally IVF embryos can make their way into the fallopian tubes, causing an ectopic pregnancy there. Because of these possibilities, it is best to keep your doctor up to date on any developments and symptoms you notice. In the case of severe pain and cramping, or vaginal bleeding, an immediate trip to your fertility clinic or the ER is in order. When can you take a pregnancy test after IVF?